I read with great interest of Andrew Alden's visit two weekends ago to the Yuba Goldfields [dead link], where he saw Yuba Gold Dredge No. 17 in operation. UPDATE (29Oct2015): Unfortunately, Andrew's original post was eliminated by about.com, but his photo, and some info, still remains. Yuba Dredge No. 17 was built in 1917 and was rebuilt twice, in the 1930's and in 2006. During it's first operating period, it shut down in 1966; it came back into operation in 2008. (The dredge did nothing for the two years from 2006 to 2008, it took two years to rebuild it, or is one of the dates incorrect?) It was described here (USBM, 1935, p. 4) as "the world's largest gold dredge." I visited the Yuba Goldfields back in 1981, when I went with a company engineer or oceanographer on evaluations of placer gold deposits and submittals. I was assigned this outreach project (outreach to another part of the company) by my boss, primarily because he thought it was a waste of time, because I was one of the most junior geologists around (going into my fourth year of exploration), and because it would give me a chance to learn something new (well, at least let's hope that last was one of his motivations!). I think we went to three prospects; the Yuba Goldfields in the Hammonton mining district of Yuba County, CA, on the Yuba River was probably our first stop. 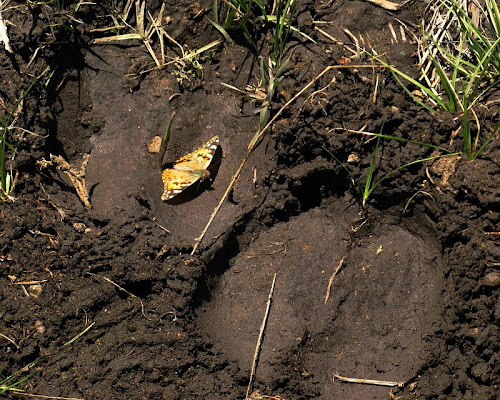 The property, a large one, was then being run by Yuba-Placer Gold Company. Gold was being recovered by reworking the extensive gravel fields, and sand and gravel products of various kinds were being produced. Yuba Dredge No. 21 was in operation when I visited, despite several online histories stating that all dredges ceased operation in 1968. Dredging operations did end in '68, with Dredge No. 21 being the last dredge to shut down, but No. 21 was refurbished or reconstructed and placed back into operation sometime in 1981, where it was in operation at least through 1988. I don't know if it operated continuously from 1981, when the price of gold was going up, through 1988 and beyond into the early nineties when the parent company of Yuba-Placer Gold Company, Yuba Westgold Inc, filed for bankruptcy, but this article states that it shut down (the second time) in 1999. It sank in 2003. 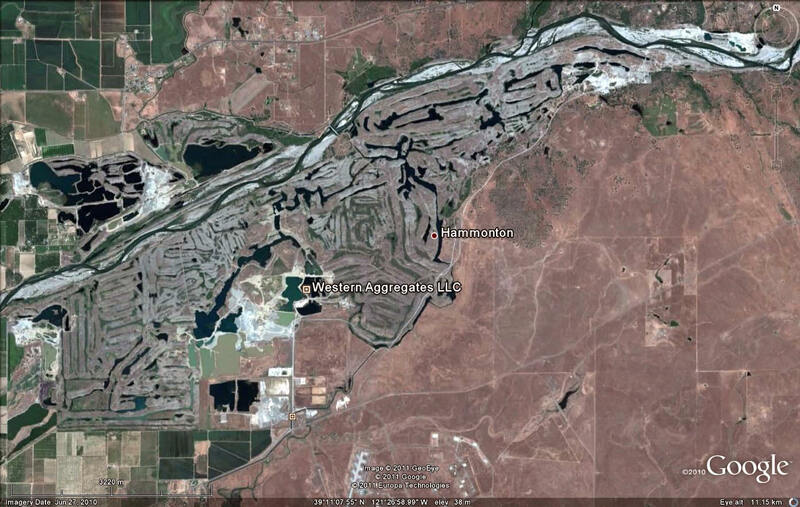 While at the Yuba Goldfields in 1981, we were given a tour of Dredge No. 21. A tour of a dredge is basically a tour of a floating mill. The dredge was huge and loud, and it had low lighting except where daylight shone through openings in the outer frameworks. There are several nice online views of the outside of a bucket-line dredges, including this QTVR at the Oakland Museum of California, and this YouTube video of Dredge No. 17, from Andrew's post. The YouTube video shows nice stills of No. 17, and toward the end has the sound of an operating dredge, a noisy ruckus that could reportedly be heard for 20 miles around. The following video shows the interior workings of the Sumpter Valley (Oregon) Dredge on the Powder River, after an ad that can't be skipped. Video about the Sumpter Valley (Oregon) Dredge from Grant's Getaways, KGW.com, NewsChannel 8, Portland. I no longer have photos from my long-ago tour of Dredge No. 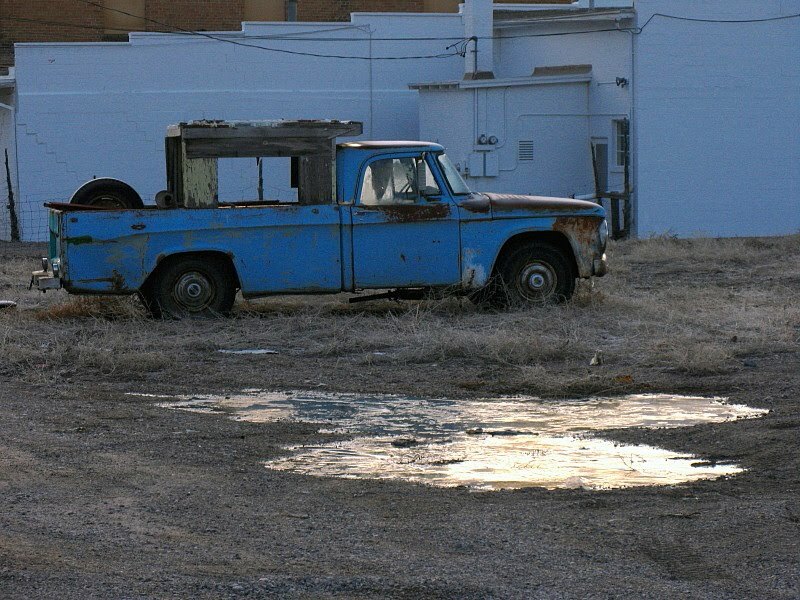 21, but found some interior photos of dredges scattered online here and there, listed below. California - Gold, Geology & Prospecting California Gold: Hammonton (Yuba River) District, how much it produced through 1968. 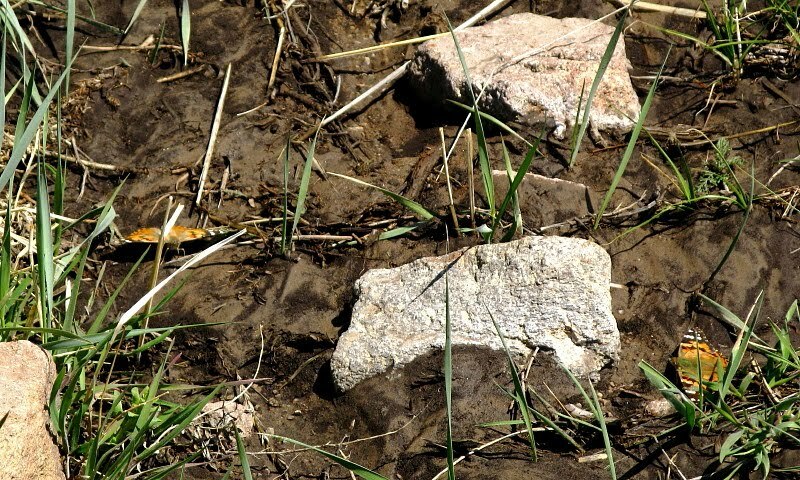 Placer Gold Recovery Methods Pictures and descriptions of Dredge No. 21 on pages 23-25. Yuba Dredges were built by Yuba Construction Company, later known as Yuba Manufacturing Company, later a subsidiary of Yuba Consolidated Goldfields. A little history of the company and its many dredges can be gleaned here through careful searching and scanning; see especially the Historical Note from pages 1-2. Numerous dredges are mentioned in the list of documents that follows. Also see Hammonton and Marigold, a book by Robert and Ruth Criddle (2007), which can be previewed here on Google Books and here on Amazon.com). 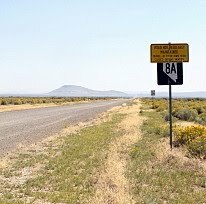 Two years ago today, on our way from here to there or back again, MOH and I hiked our usual central Nevada trail from Highway 50 near Cold Springs to the Cold Springs Pony Express station, high on an alluvial fan on the west side of the Desatoya Mountains. The first hike report, about horned lizards we saw on the trail, is here. 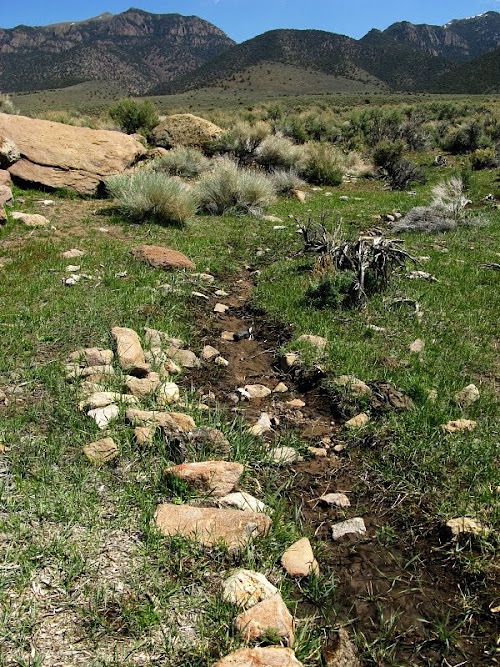 It was spring, and the usually dry creek, which must have at one time provided year-round water to the station, was muddy, though not flowing. 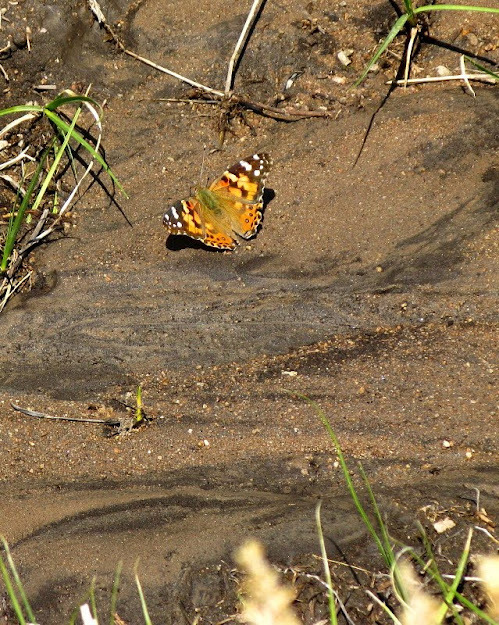 Several Painted Lady butterflies were hanging around in the creek bottom, patiently waiting to have their pictures taken. The butterflies were eveywhere, and it was hard not to get two or more in the same photo. Here's one that posed for a considerable period of time, opening and closing it's wings so I had time to get the perfect shot. These butterflies are officially known as Vanessa cardui. 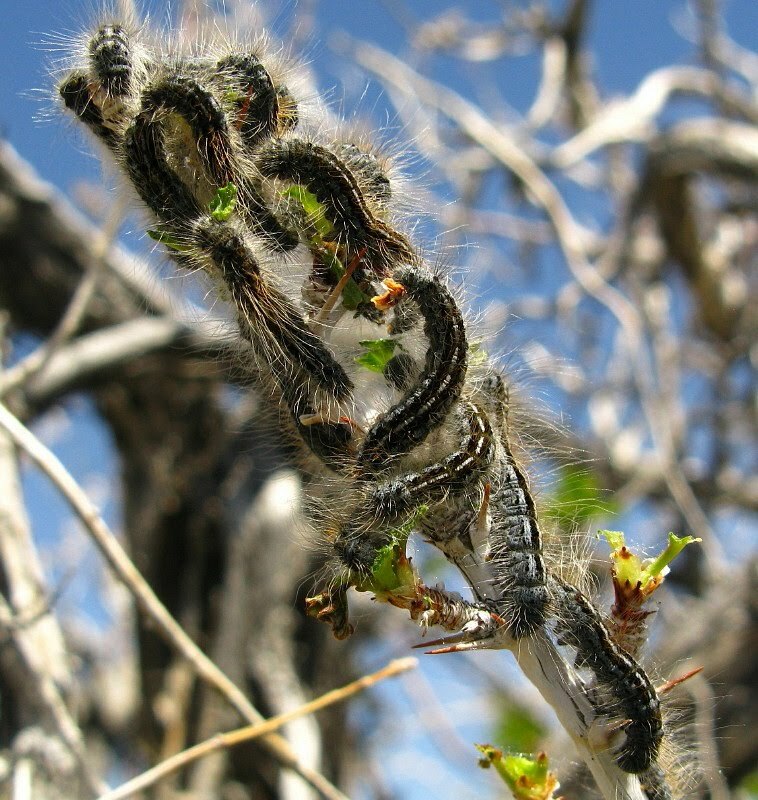 They can be found almost everywhere: for example, I've seen them flying by in the middle of the Black Rock Desert. After observing the butterfly convention and taking several photos of the station itself (not yet posted anywhere), we decided to mosy back to the parking area down near the highway, taking an unmarked route along a dry wash to a nearby side road. 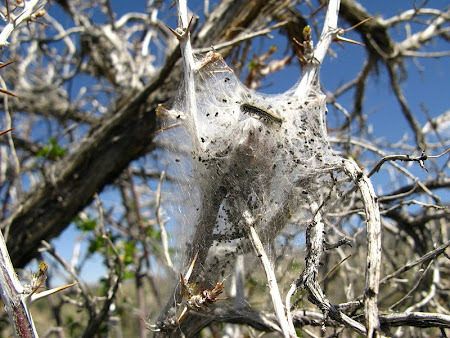 We came to a bush in the dry wash, possibly a Purshia tridentata, that was overgrown with caterpillars. 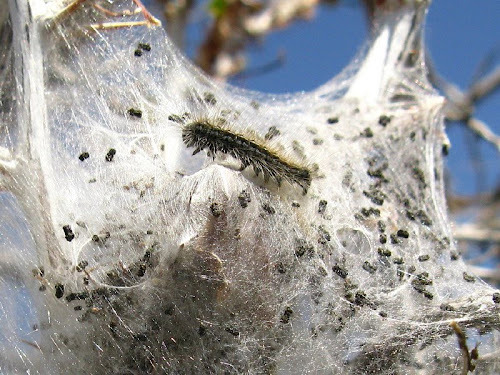 ...and tents crawling with striped caterpillars. 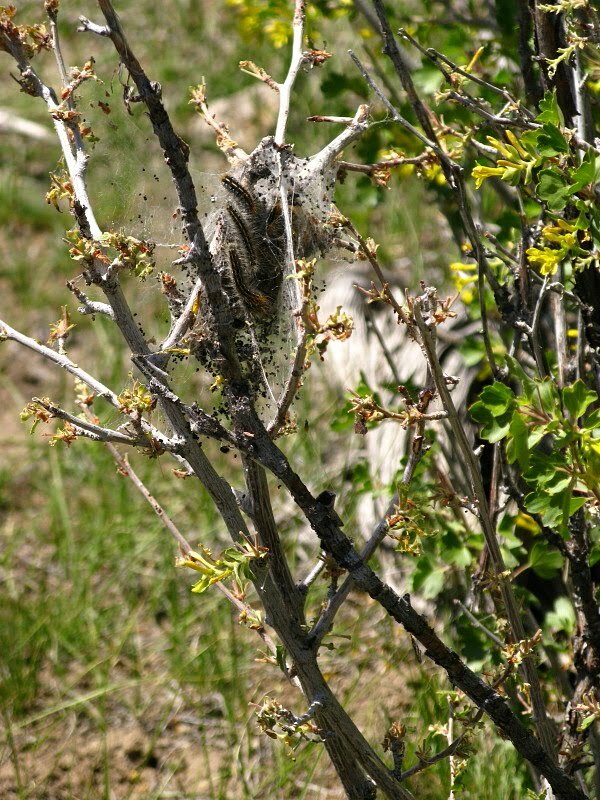 Although the butterflies and caterpillars were associated closely together in time and space, I was pretty sure that the Painted Lady was not involved in stringing such wild, ever present white tents on so many bushes. 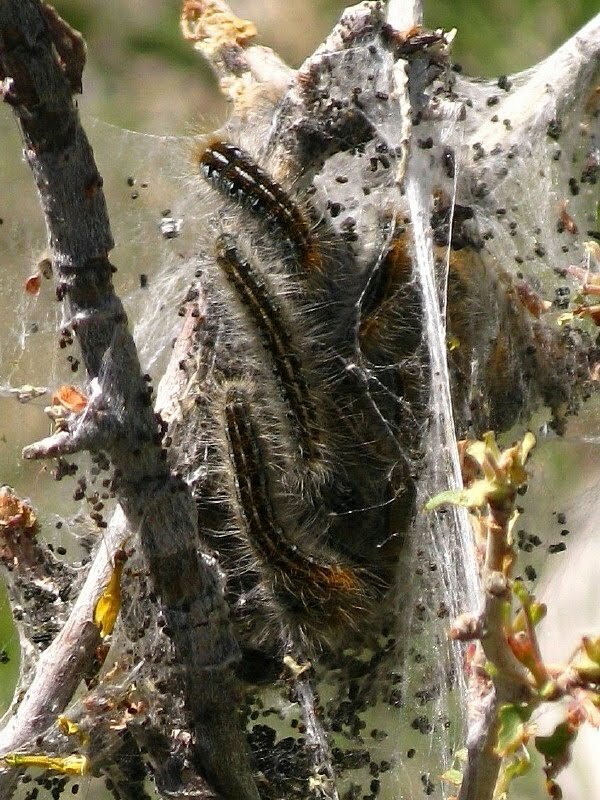 And it's true: the western tent caterpillar, Malacosoma californicum, is unrelated to the often gregarious, usually friendly, and brightly colored Painted Lady. Indeed, the western tent caterpillar gives way, eventually, to a rather plain brown moth and is known primarily for its defoliation of bitterbrush, willows, cottonwoods, mountain mahogany, and other trees and shrubs. About a week ago after several days of warming that followed our huge snow dump of April 7th and 8th, a part of a local outcrop gave way in the middle of the night, with this large rock coming to rest at a roadside pullout. I stopped to take pictures a day or two later, pulling across the road into another pullout away from the crumbling, cliffy limestone. You can see the hole left by the chunk that fell, a chunk that then broke into small and large pieces. And notice uphill of the exposure where the hole is: it looks like the whole lower mass may have broken loose from the upper mass at some point, perhaps before the road went through, or maybe that's a small, curvilinear fault (see first photo). The large rock and a few of the smaller chunks, were carefully protected by orange cones and Caution Tape. 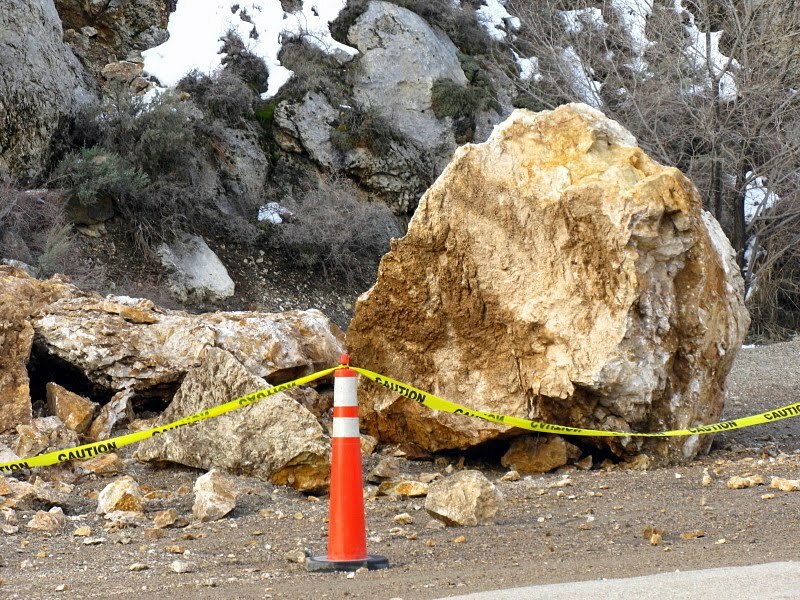 The Caution Tape has since been removed, as have many of the smaller chunks, with the large rock still sitting there in reminder of the freeze-thaw action of many years. 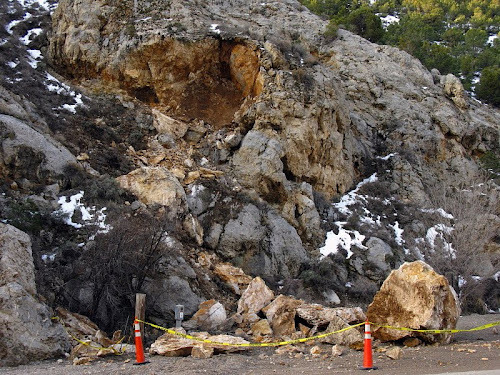 The pullout no longer looks like a good one to use, as the back half of what remains to one side of the large hole looks unstably fractured and overhung. A "Falling Rock" sign is posted just past the downed rock for uphill travelers through the canyon; there is no companion sign on the other side of the road for the downhill approach. 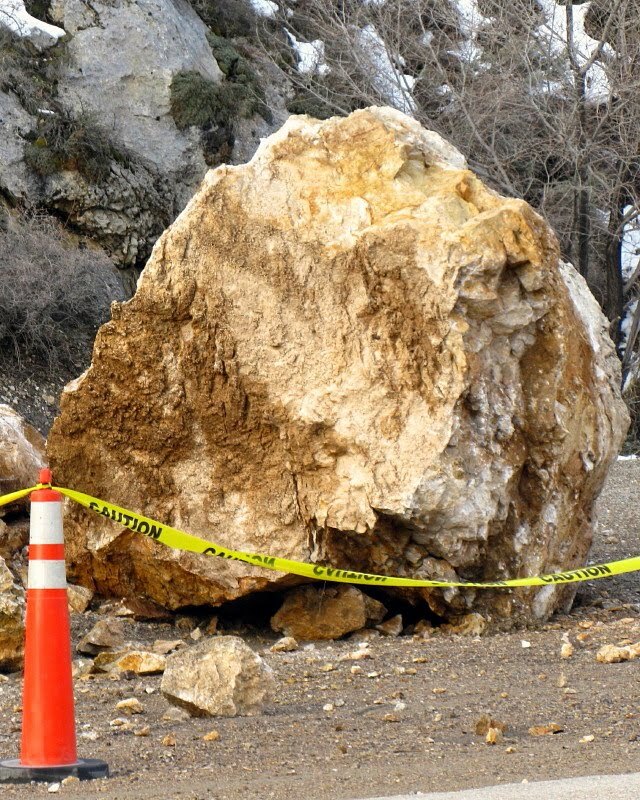 'Tis the season for roadside rockfalls, so watch where you park! 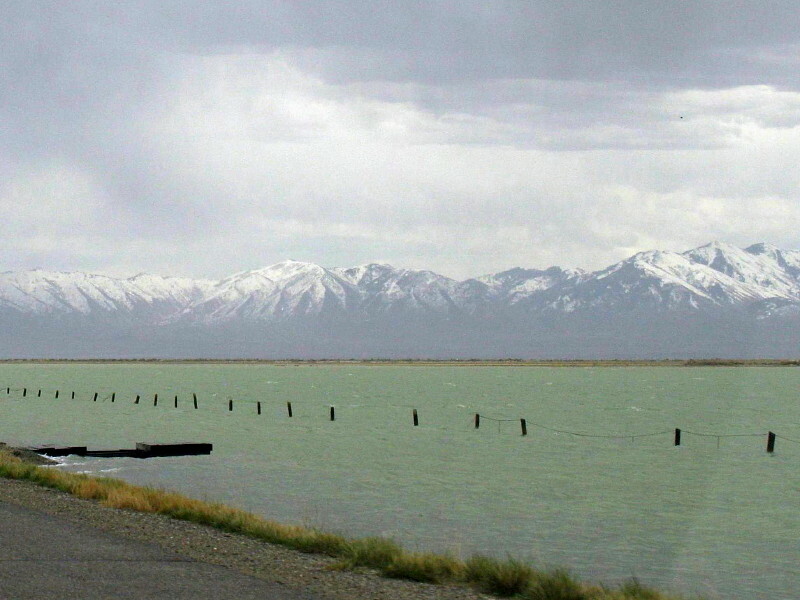 The bluish Bovine Mountains about 8 miles north of I-80 and, to the far right, the white, snowy Mount Harrison, a 9265 foot-high peak in Idaho, more than 60 miles north of Interstate 80 ... all behind the much closer Floating Island ... as seen across the mirage of the Great Salt Lake Desert, April 3, 2011. 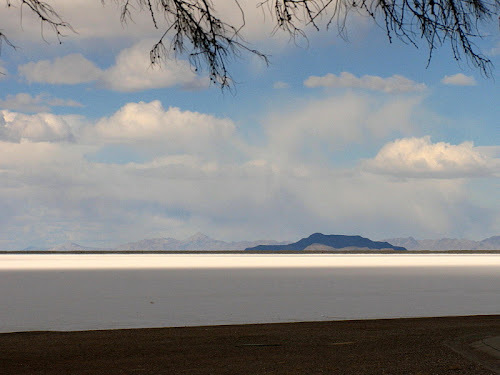 When crossing the Salt Lake Desert from east to west, as came to pass on both trip one and trip two, we eventually came to the place where the salt flats to the north are not blocked by dikes of dirt or water control bars along I-80. 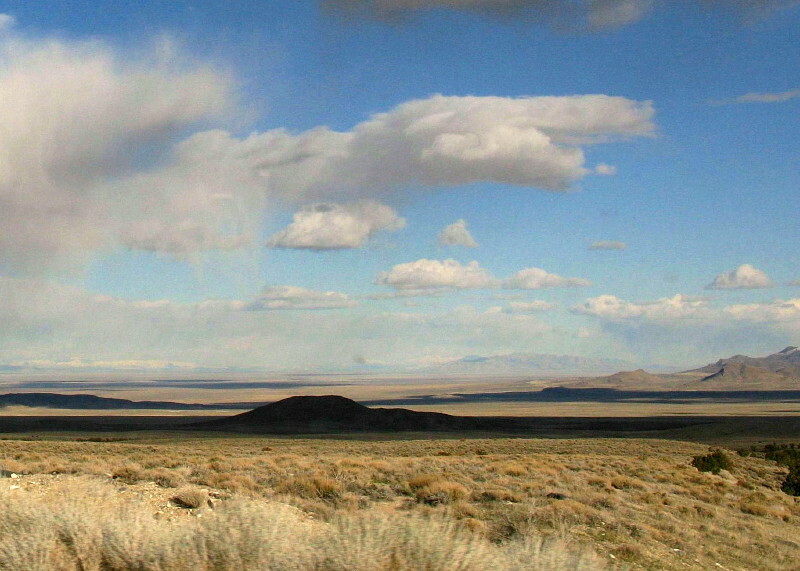 The dikes disappear less than two and a half miles east of the northern rest stop near the Salduro railroad siding. 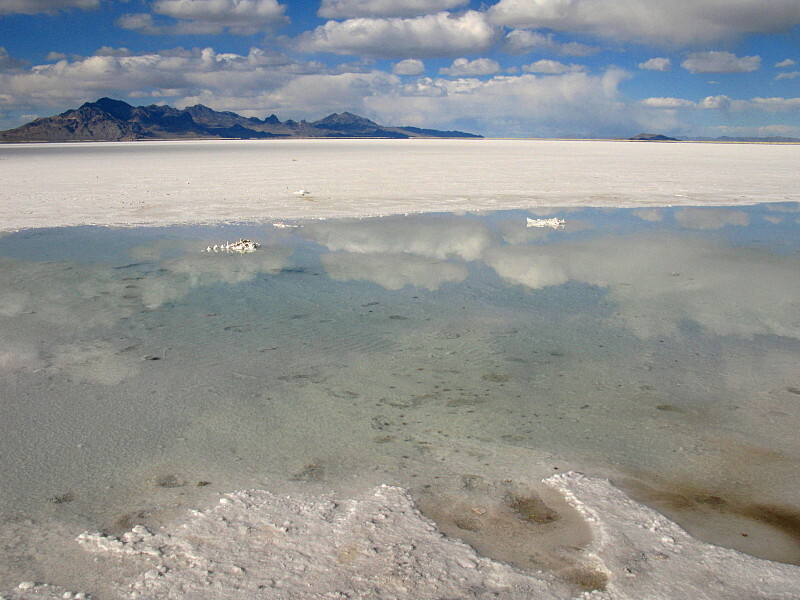 At that point, uninhibited views of the vast desert appear, and any mirage that has formed becomes completely visible, unblocked by the previous water control bars. I've never seen the desert without at least a thin mirage. Mirage: not only does it appear that you can see water or sky beneath the dark, semi-detached island, but a thin white line floats across just left of center and just beneath the dark island, crudely marking the top of the playa surface (click to enlarge). 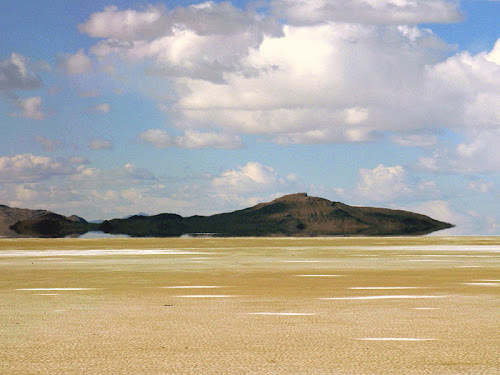 Floating Island (right) begins to detach from the Silver Island Mountains (left). 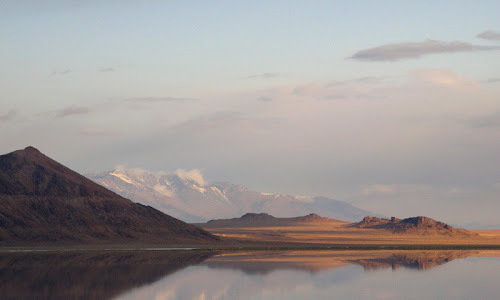 The white mountains to the right of Floating Island in this photo are the Raft River Mountains (of core complex and detachment fame). The mirage of the desert causes the islands, large and small, to become like Rorschach tests, changing constantly with the lighting and the change in view angle resulting from our 70 mph speed. 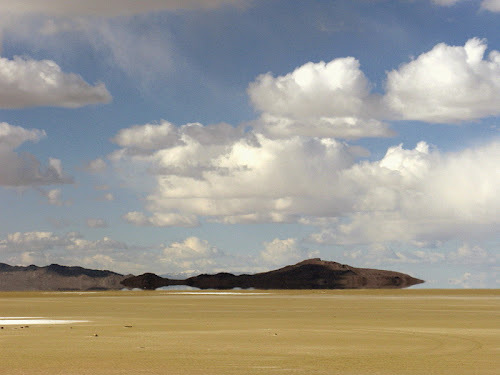 An appropriate name: Floating Island appears to float away from the Silver Island Mountains as you drive east to west; it also appears to float above the playa surface. Floating Island can be seen clearly from the northern of the two Salduro siding rest stops. The dark line across the playa, above the white band where the sun is lighting up the ground, is probably a water bar, dike, or raised road protecting either the northern rest stop or the Bonneville Salt Flats racing area (the curved dike on MSRMaps). The apparent height of the dike may be enhanced by mild mirage, and some apparent lack of view of the lower part of Floating Island may be due to the curvature of the earth across 2.5 miles. The theoretical horizon distance for a short person like me is about 2.7 miles without considering refraction, and about 2.9 to 2 miles with a "normal" amount of refraction and no mirage, which will extend how far a person can see. Read more here. Mirage and Floating Island pictures are all from April 3, 2011. 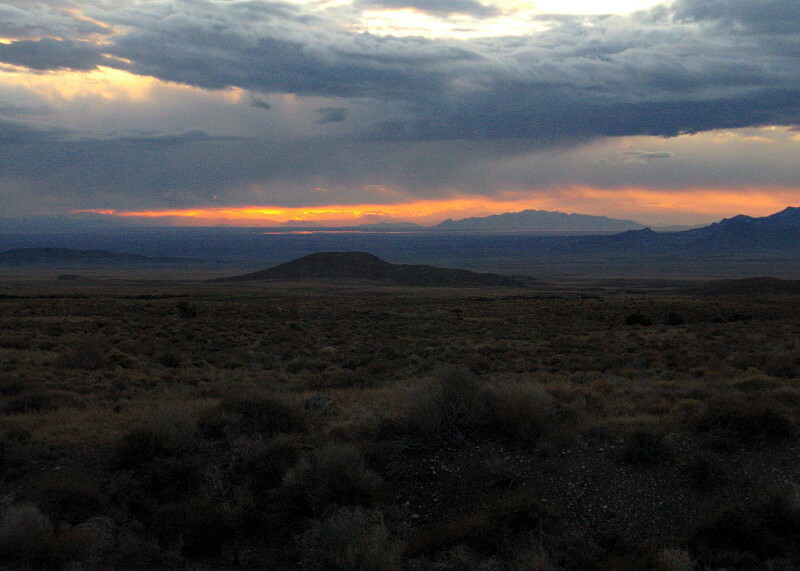 Last updated April 26, 2011. Corrections made to properly identify mountains in the distance. For a long time, when I was young, I really wanted to someday have a stone house to live in, and I think that thought started somewhere between our home in northern Virginia and the National Zoo in downtown D.C. I vaguely recall that we drove by a particular stone house while going to the zoo, or to other places downtown, and it became my favorite, something I aspired to live in someday "when I grew up." As for pictures, because I didn't spot anything while driving around here locally, perhaps my stone house or cottage would look something like Moore's Station, or maybe it would look something like this hobbit home. My original stone cottage was made of large, gray, roundish stones of unknown rock type, and it had large stone steps leading up to it. I can't say for sure whether ivy grew on the walls, but tall, thick trees partly hid it from view, making it appear mysterious and even more enticing. It was in the middle of a city where I would no longer want to live, and probably wasn't as colorful as this painting. 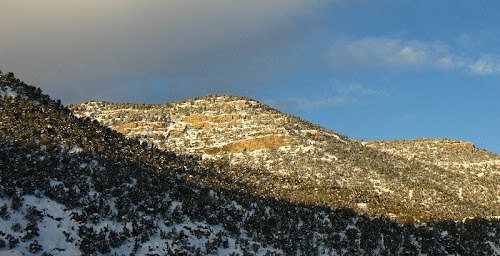 After moving back to the west, I gradually learned to stop wanting to live in such a building because I consider Nevada to be earthquake country, with stone and brick houses just sitting there waiting to fall down in some next future earthquake similar to whatever one created the nice fault scarp on the eastern range front of the Carson Range near Genoa. 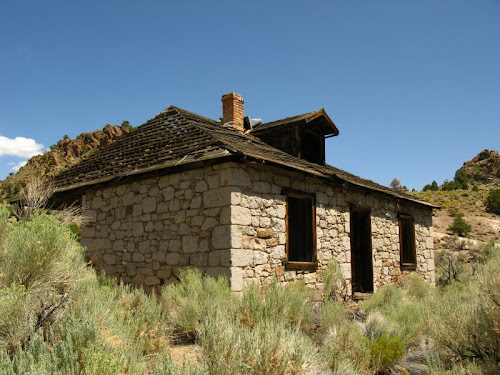 Old buildings like this one at Pritchard's Station, made of ash-flow tuff and sitting out in the middle of nowhere, are probably as close as I will come to having a stone cottage or cabin, though we would like to have slate or other stone siding on lower exterior walls when we build, maybe some slate walkways through garden areas, and it's always possible we'll have some slate as part of the floor near an entryway. In the meantime, I realized this morning that I prefer to have most of my rocks outside, and that our building plans are pretty vague. Also, my few indoor rocks are messily and non-photogenically lying scattered through the house, and my yard rocks are out in the mud, currently getting re-covered by the latest snow shower (a relatively miniscule thing compared to the snow dump of April 7th and 8th). 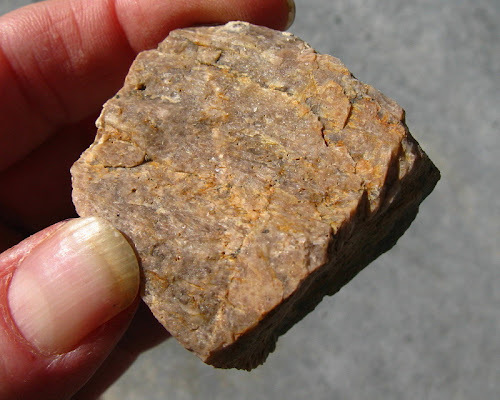 I also realized that we have all the rocks we want on the hill above our house, along the roadside as we drive to work, and everywhere we go out in the field. Written April 13th and submitted to the April 2011 Accretionary Wedge at Geological Musings in the Taconic Mountains. After appearing in our backyard a couple weeks ago, and then disappearing during the huge snow dump of April 7th and 8th, our one robin has returned to remind us that it's spring. The first robin is usually most noticeable in early morning becuase of the distinctive song it sings after (while? during?) getting the early worm. Typically, after a few days of hearing the song, we will finally see the robin sitting on a high perch in a nearby tree. Shortly thereafter, the first robin's many robin friends will arrive, and we will know that spring is in full swing. We are still awaiting that latter stage. Other people, I am told, mark the true arrival of spring by the opening of the local golf course. Not I! I'm more of a robin-type of person. 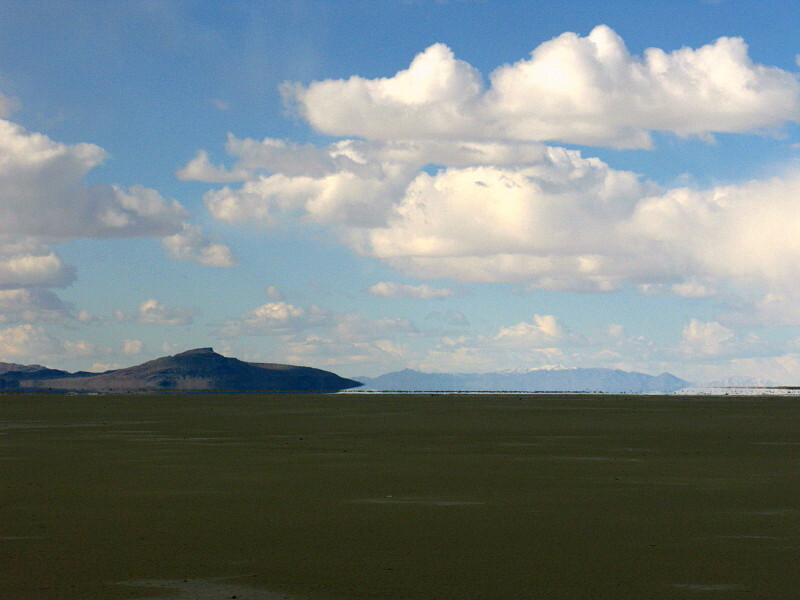 Looking east across the Great Salt Lake Desert toward Granite Peak from the vicinity of Dead Cedar Wash. March 3, 2010. The first trip began early in the morning on ALT Highway 93 as I headed north toward Wendover, Nevada. The sun had barely risen, and reflections from the desert were a bright red orange. The second trip ended with MOH and I driving past the same spot early in the evening of April 3, 2011, almost exactly 13 months later. 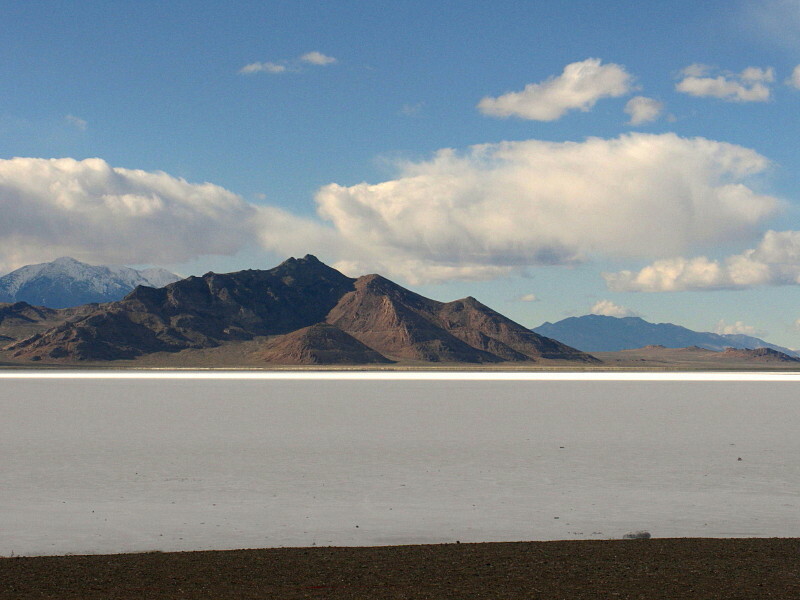 Silver Island Mountains and Bonneville Salt Flats. March 3, 2010. On the first trip, I stopped at the southernmost rest stop near the Salduro siding, where an elevated viewing area provided me this view of the Silver Island Mountains north of the east and westbound lanes of I-80. 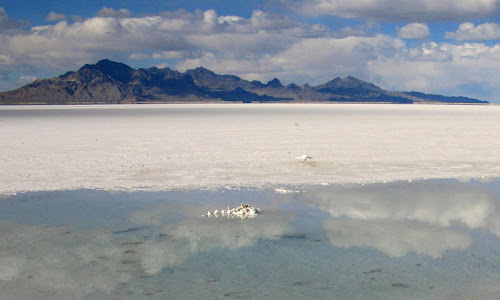 The Bonneville Salt Flats were full of water when I passed by the first time; they were salty and mostly dry earlier this month, as seen in the first photo of my last post, and in the zoomed in version below. 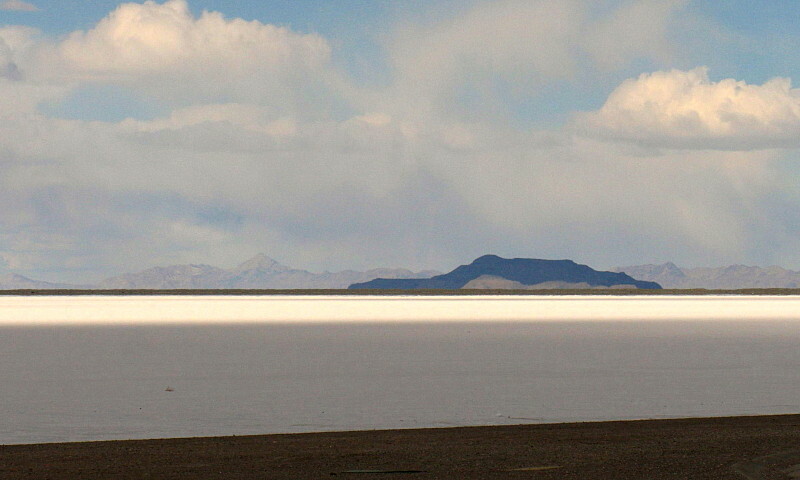 Silver Island Mountains and Bonneville Salt Flats. April 3, 2011. 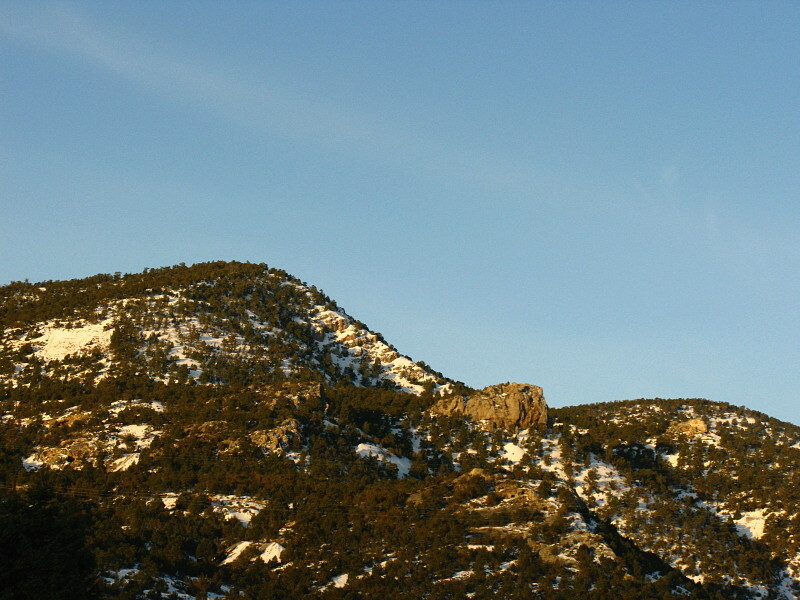 The Silver Island Mountains show some of the lower shorelines of Pleistocene Lake Bonneville: several old beaches near Silver Island Pass are highlighted by early morning shadows on the right; two wave-cut notches are almost hidden in shadow on the left. The snow-capped peaks are probably the Pilot Mountains. March 3, 2010. The angle's a little different, but that's salt out in front of Tetzlaff Peak, the highest peak in the foreground, and maybe a bit of water or a thin mirage near the far edge of the flats. 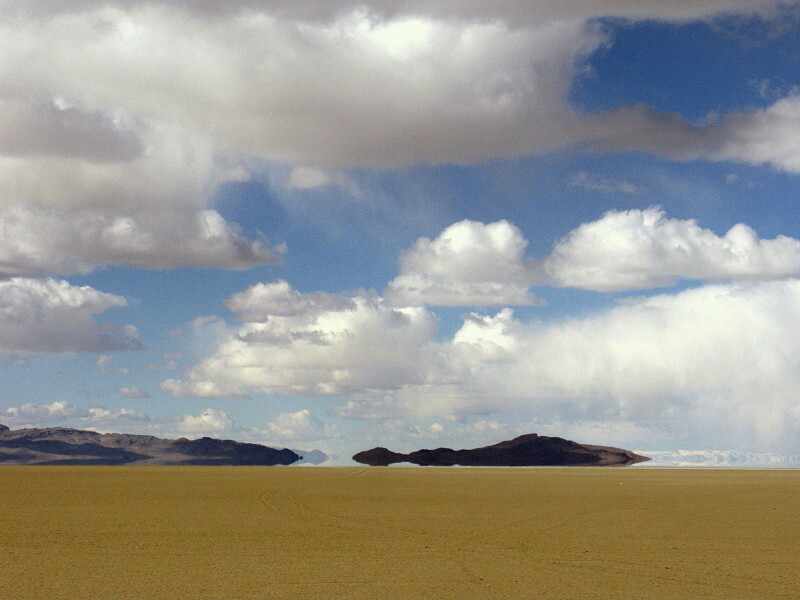 Those are the same low hills near Silver Island Pass on the right side of the photo, the same Bonneville shorelines and notches cutting the angular hillslopes as in the previous, somewhat zoomed in photo. April 3, 2011. 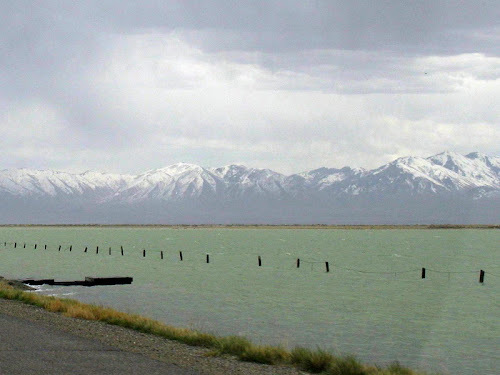 In March of last year, after leaving the Salduro rest stop and heading toward the SLC airport, I drove by the place where water of the Great Salt Lake was over the road in the spring following or during the El Niño of 1982-1983 (May, 1983). I thought the water looked kind of high, although I'm not well versed in its normal yearly fluctuations. 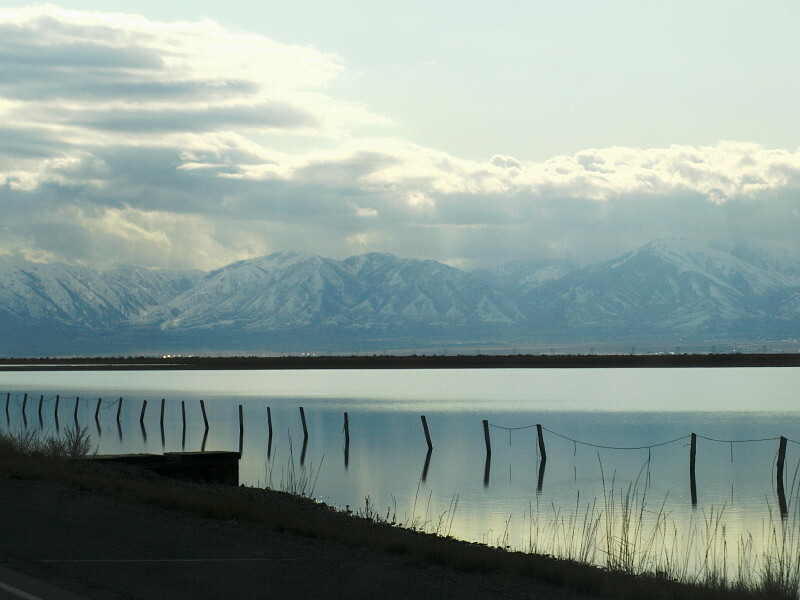 I was about two and a half miles west of Burmeister and the Tooele-Grantsville exit on I-80 (MSRMaps location), looking toward the Oquirrh Mountains when I took the first picture (above) on March 3, 2010. Strangely enough, the water once again looked high to me when we passed through early this month, and indeed it was higher: a year and one month after the first trip, spring runoff from the Wasatch Mountains (and other ranges) may have been in full swing. 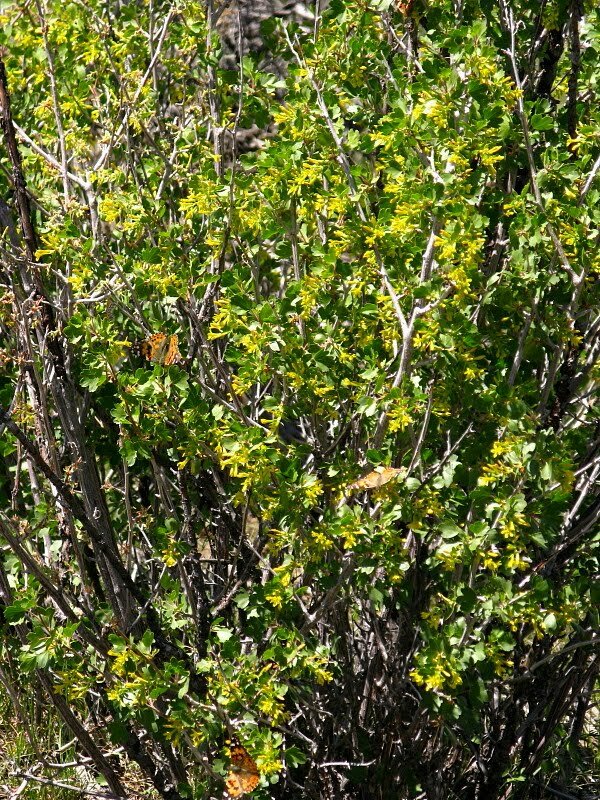 The second photo (above), from April 2, 2011, shows the exact same fence posts as the first, due to extreme luck and clever cropping. 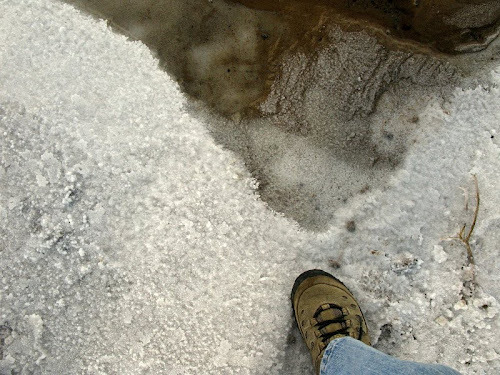 For the first trip I arrived at the SLC airport and went off to Alaska. On the second trip, MOH and I arrived in Ogden and, before re-crossing the desert on our return trip, we visited a brewpub, dinosaur park, and very cool canyon. 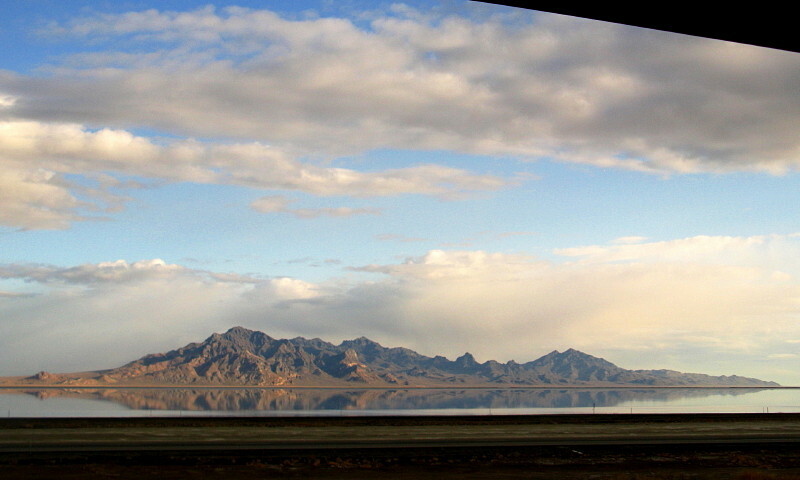 Bonneville Salt Flats looking north toward the Silver Island Mountains and Floating Island (small and to the right). While on our recent trip to Ogden, Utah, MOH and I stopped at the northern of two view-oriented rest stops located on I-80 near the Salduro railroad siding about 8 miles east of the Utah-Nevada border (MSRMaps location). Both rest stops provide good viewing of the Bonneville Salt Flats. From the northern rest stop parking lot you can walk out onto the flats, or at least to the edge of the flats, depending on water level or dryness. I didn't walk out very far, just to water's edge. A few other people were out a little farther; someone was collecting salt in large bags, probably for personal use. 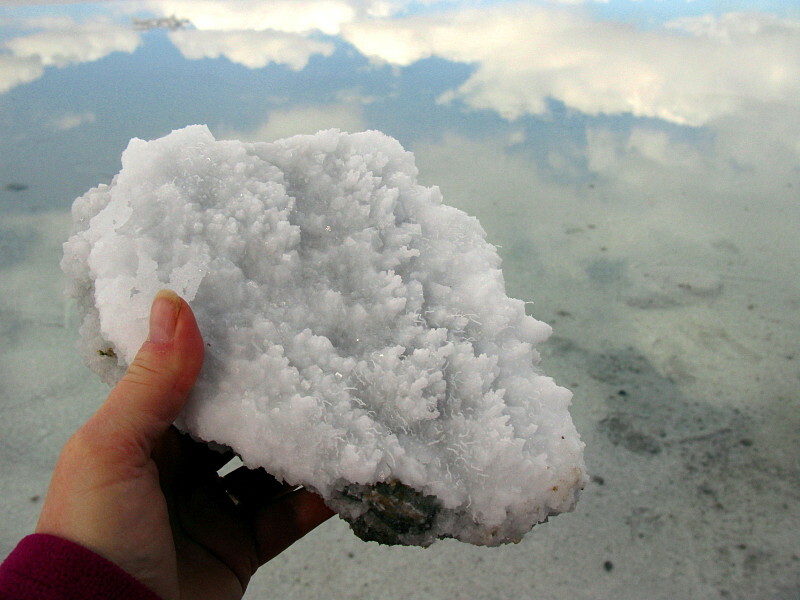 A chunk of salt in its native habitat. 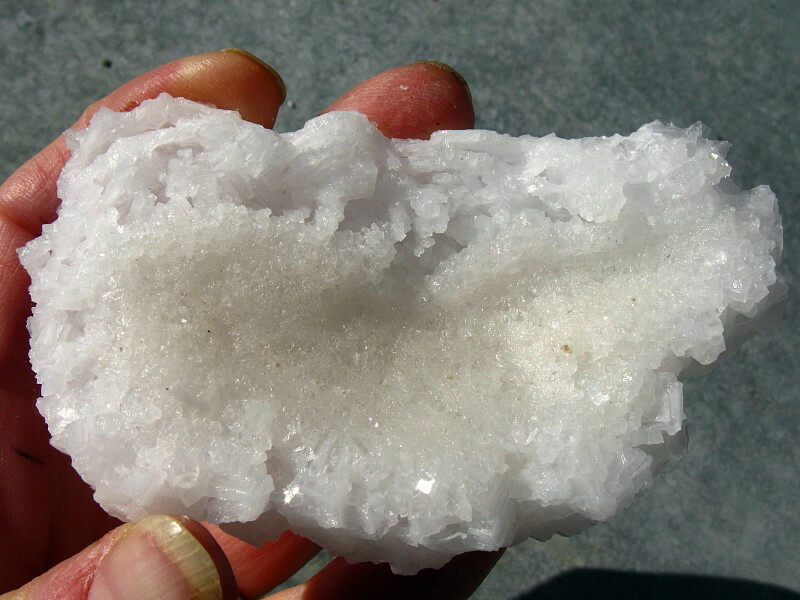 MOH brought a small piece of salt home, to add to our mostly unlabeled mineral collection. 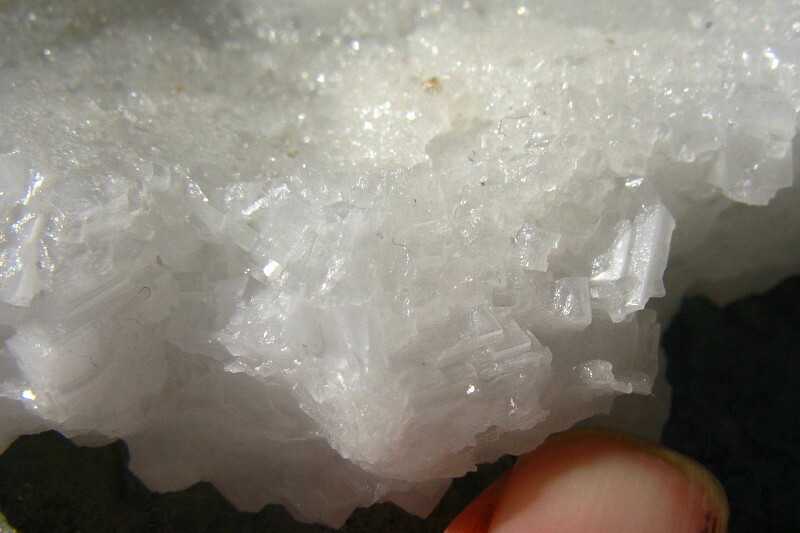 This is the side with the largest crystals. 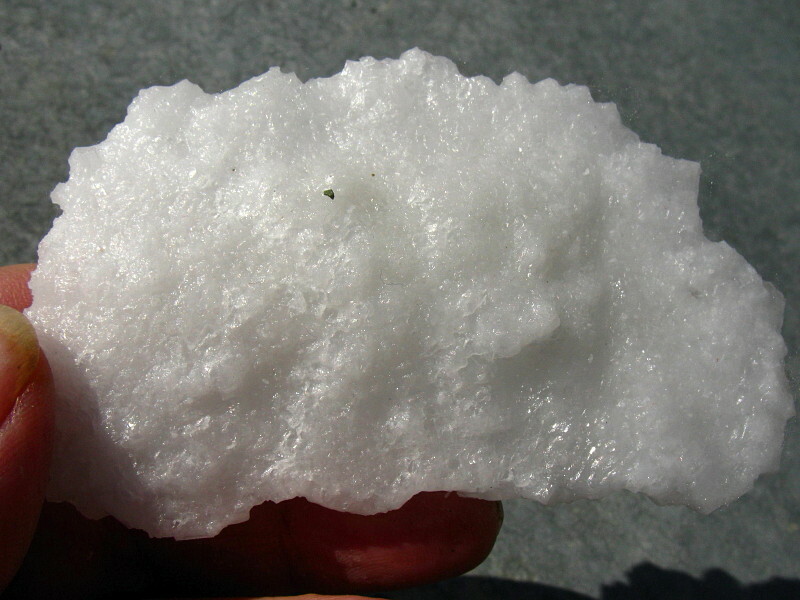 Side view of same salt chunk. View of the opposite side. One of the two sides had encrusted a surface of some kind; I'm not really sure which side was up and which was down. Salt, more properly known as halite or NaCl, is a cubic mineral. Cubes on top of cubes. 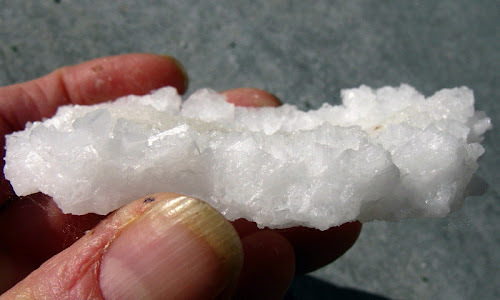 Halite is a relatively soft mineral with a Mohs Hardness of 2½, meaning that it's barely not scratchable with your fingernail (which is also 2½), but it can be scratched by almost anything else, including a copper penny, a knife, a piece of glass, and steel. 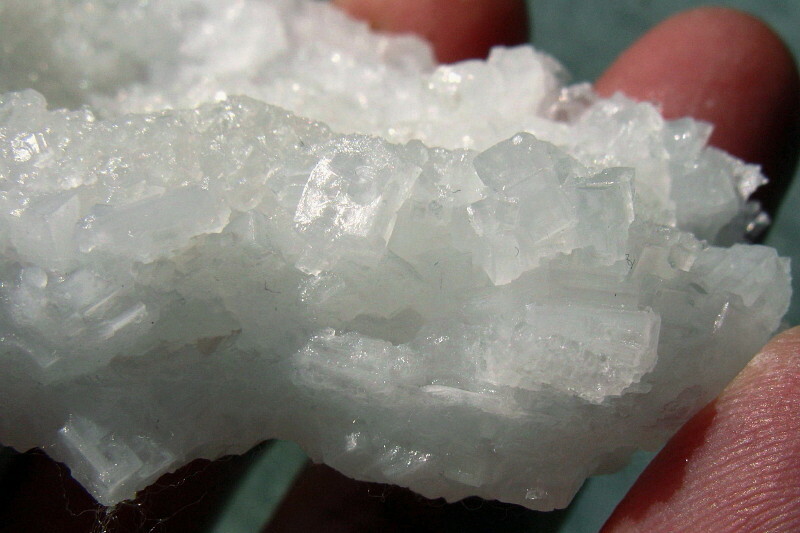 Halite tastes salty (surprise! ), but not as bitter as the related potassium salt, sylvite (KCl). Potash (mostly KCl) is mined from the Bonneville Salt Flats, as is magnesium chloride brine, which is used to produce magnesium metal and chlorine gas (for various purposes), and magnesium chloride, which is used as a dust suppressant on dirt roads and for other products. 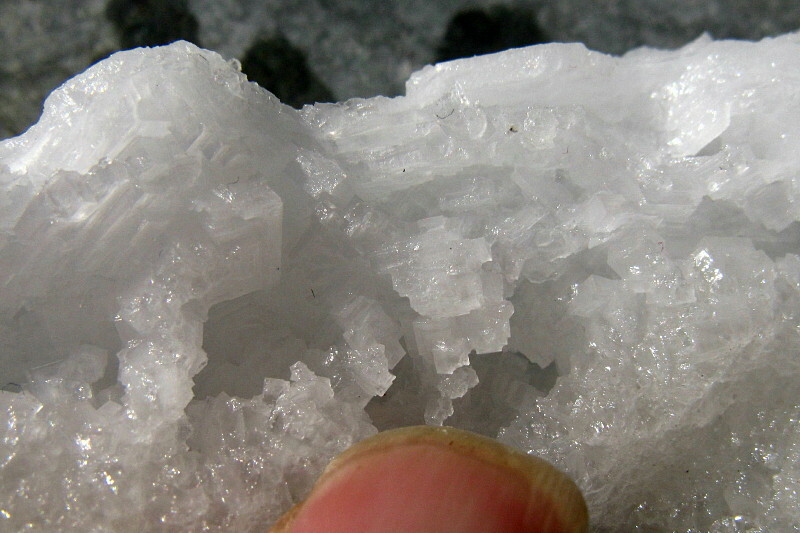 On a not-so-recent hike, when snow had turned to mud (mud then dried and turned back to deep snow by yesterday), this small and rather unprepossessing rock caught my eye. Perhaps you're wondering why. One side was glinting at me in the low afternoon light. 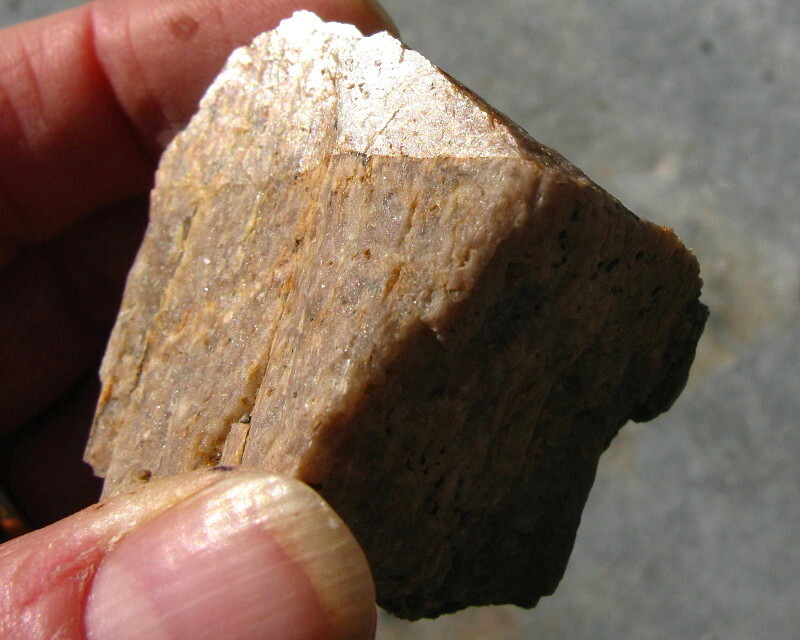 I reached down and grabbed it, immediately recognizing it as a moderately sizable, though incomplete, orthoclase feldspar, one type of K-spar, with a Carlsbad twin. 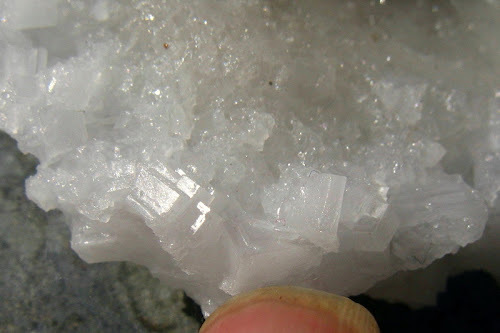 You can see this type of twinning in a sanidine crystal (sanidine is a related type of K-spar), and read more about K-spars at Life in Plane Light. 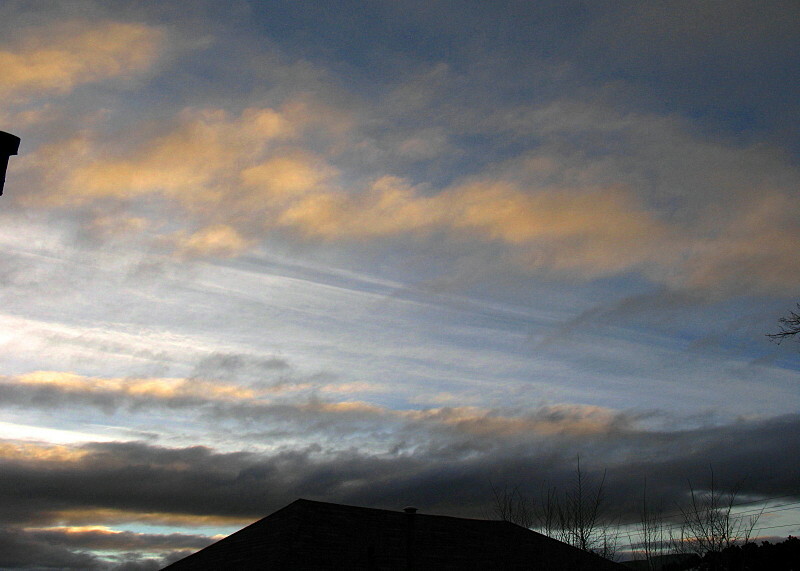 A view looking end on at the visible twin plane (above), and with light reflecting off the upper twin (below). Two views with alternate twins highlighted by the sun, above and below. 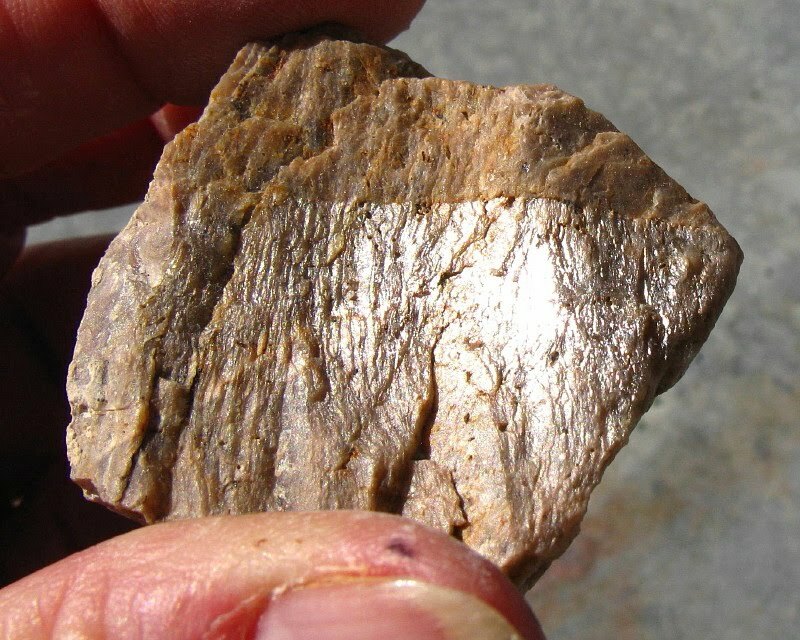 I recognized this feldspar as being from nearby intrusive rocks that are often porphyrytic, and which usually contain large phenocrysts of dull pink K-feldspar like this one. 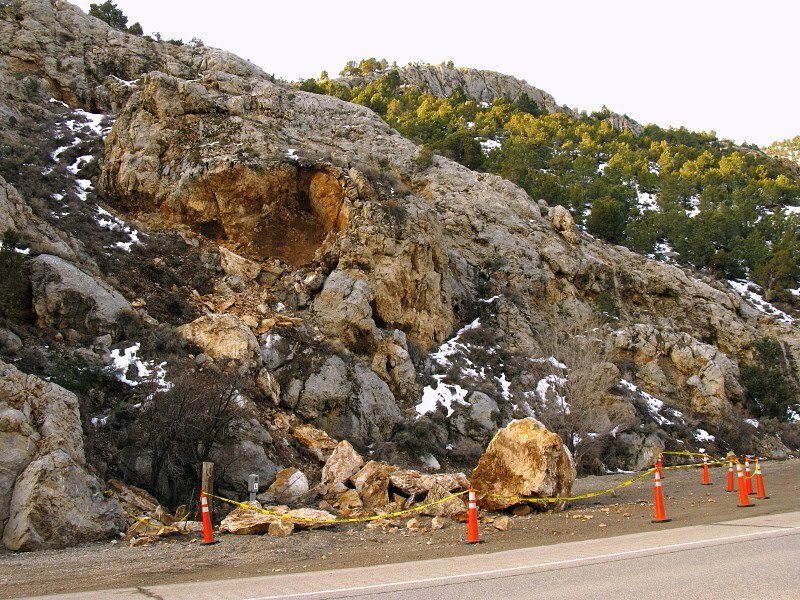 Having never seen any exposures of porphyry dikes or masses on our hiking hill, I wonder if this feldspar has eroded from old alluvial fan material that formed from sources now eroded or sources farther up the main canyon than our side of the hill. 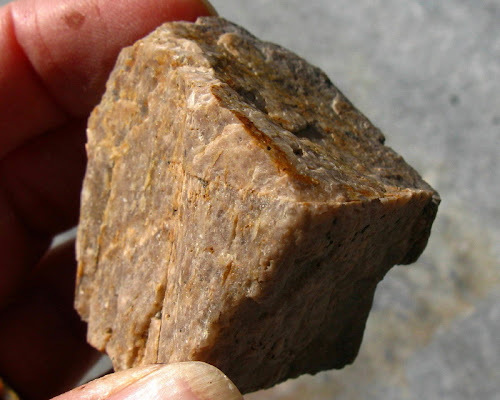 Either way, it makes me want to look for unmapped porphyry. At least two limestone formations and at least one shale without any moon: taken before 7:00 am on March 27th at nearly the same time as the moon picture from five days prior (here). 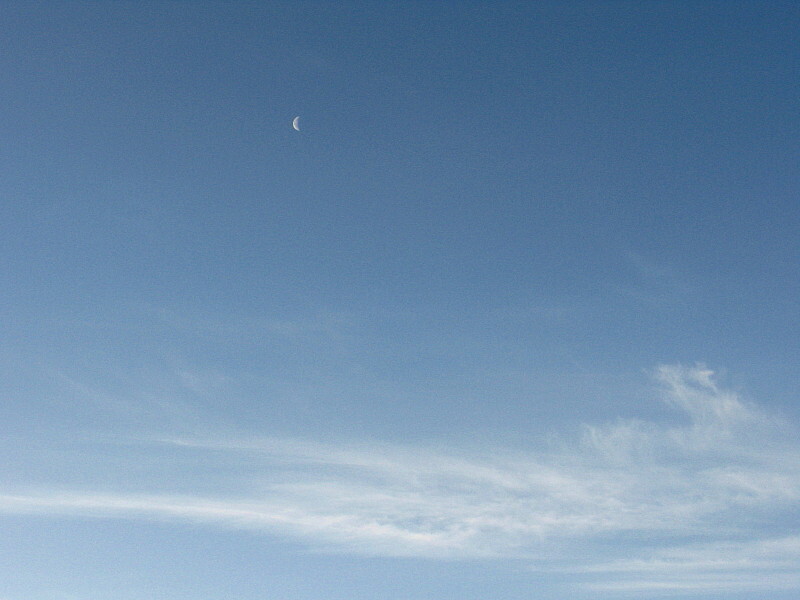 The just-past-quarter moon as seen farther east in the sky that same morning. One of my views on the way home from work, with a snowy hill of Tertiary ash-flow tuff on the right and the cyclothemic Pennsylvanian Ely Limestone on the hill behind that. 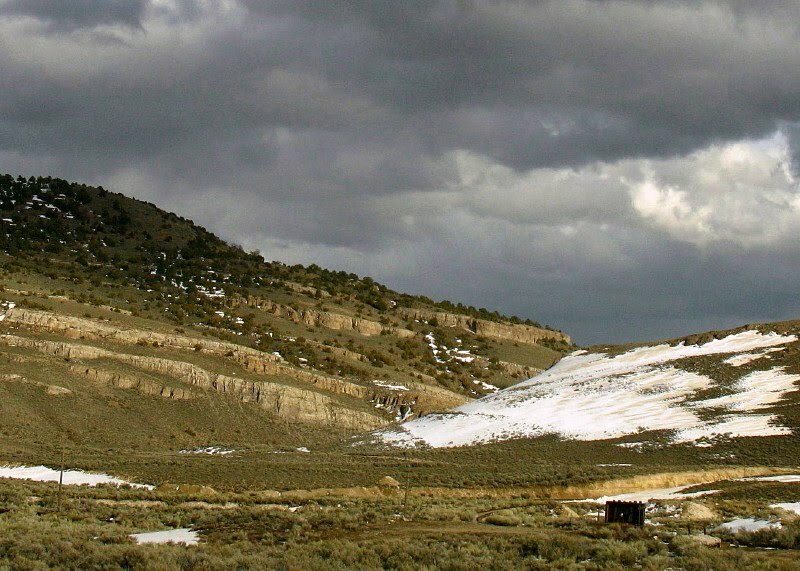 The dark hill on the left, above the Ely Limestone and beneath the dark clouds, is underlain by the garnet-bearing rhyolite of Garnet Hill. March 27th. 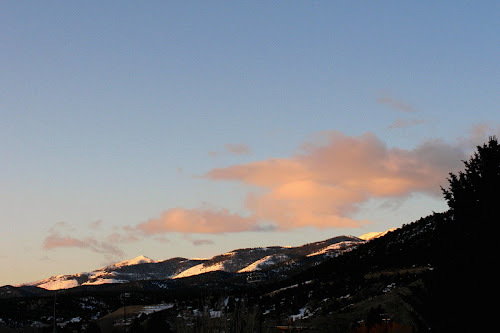 Alpine glow on Ward Mountain, March 28th. I see this truck every morning on the way to work. It hasn't moved in more than three years, unless it moved when I wasn't looking and returned to the same spot. The ice was everywhere that week early in the morning, melting most days to rampant mud. March 28th. March 29th: a day of no pictures; a day with snow that fell like rain, slanting northward from the southerly wind; a dreary day that at 30 to 34 degrees Fahrenheit felt colder than the chill of all the 20 degree mornings of the several previous sunny or semi-sunny days; a yucky, mucky day. Two photos of the sunrise the morning of March 30th, above and below. 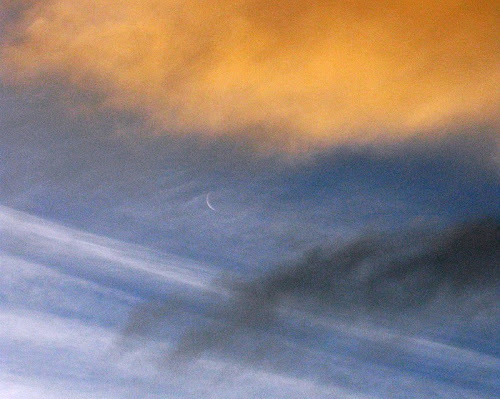 The last sliver of the waning moon playing peekaboo behind the clouds. Color has been somewhat intensified or weirdicated during enlargement and addition of contrast to make the moon more visible. 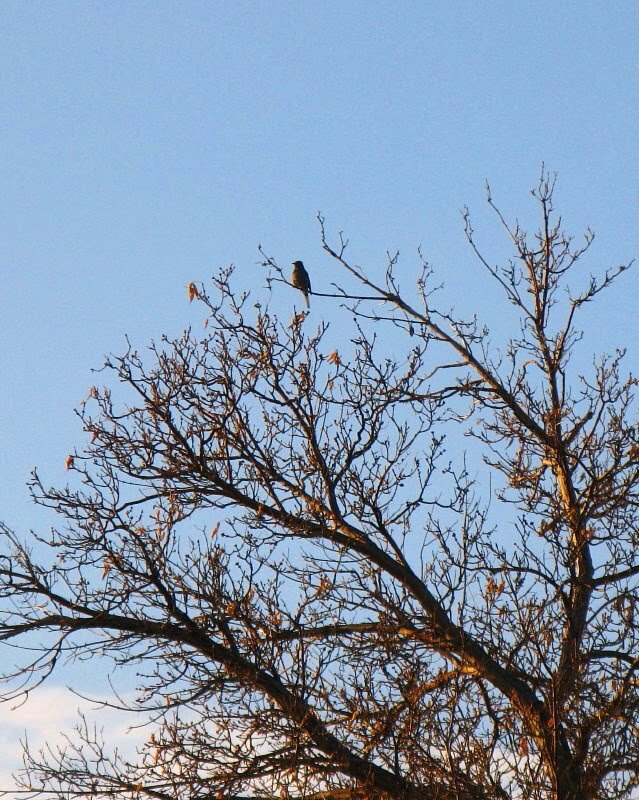 The robins have been back for about a week: spring is here!